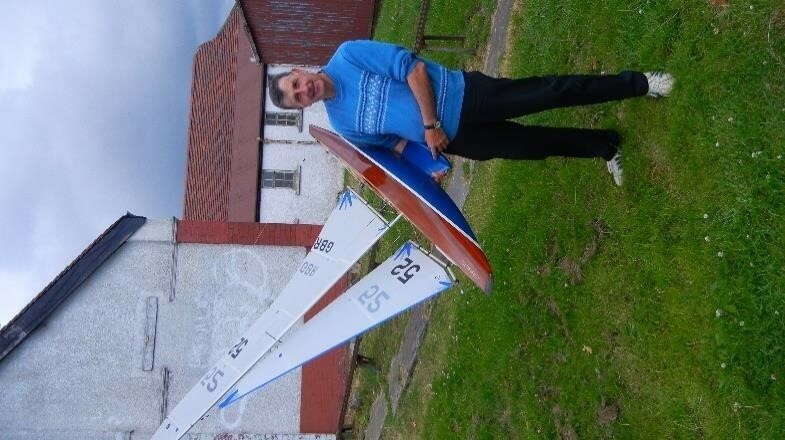 The following is a History and Heritage of Paisley Model Yacht Club. When you read it and the resume of the people that formed, influenced and took great pride in our yacht club over the years, I think you will get a sense of the outstanding Community Heritage of the yacht club. In my opinion it is certainly a history that all of Paisley should be proud of and celebrate. It is a Heritage that in many ways is unique and via the iconic Barshaw Park pond and the yachts sailing there continues the link to the industrial giants of the past who shaped our town. The Paisley Model Yachting Club has a history that will be hard to be matched by any other and deserves that we ensure the efforts of the past and the legacy left us are not forgotten and it continues to flourish in the future. 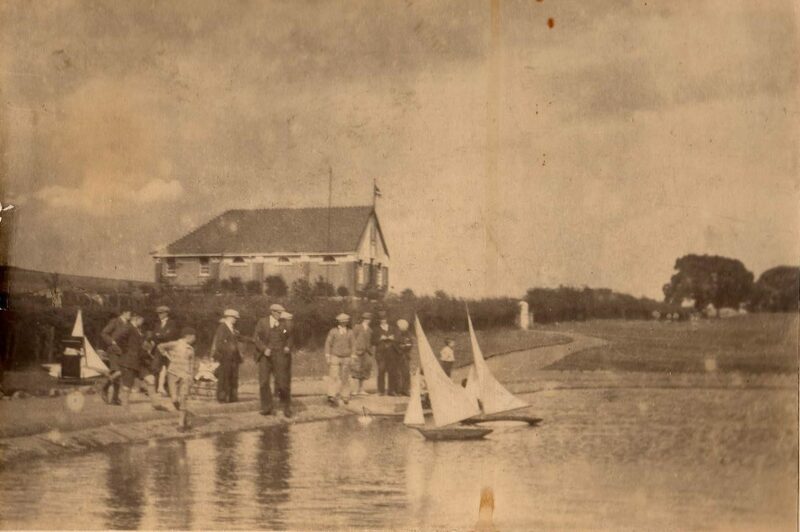 Part I covers the Model Yacht Club History along with some interjects of Barshaw Park history that you may find interesting. Part II gives the reader a flavour of the Heritage of the club by way of a resume of the people referred to in Part I (refs). Part I History of Paisley Model Yacht Club. 1895 The first meeting of Paisley Model Yacht Club was held in the house of Mr Thomas Scott in Lawn Street on 5th January 1895. Mr Andrew Fletcher who took the chair stated that he hoped the town council would consider the construction of a pond in the proposed new east end park that would match the ponds of Victoria Park (1886) and Elder Park (1887). The club had no home water to sail on and had approached proprietors with private garden ponds in the area for permission to sail on them. Although the owners sympathised with the clubs objective they refused permission to use their ponds. This left the club having to travel outside the area and use other clubs ponds to enjoy and further their sport. 1899 In 1899 Sir William Dunn presented the club with the Sir William Dunn Cup .This was awarded annually to the yachtsman who was the seasons overall champion. 1900 The yachting club had some of Paisley’s well known industrialists as patrons. The 1900 AGM held in the Commercial Hotel records Sir William Dunn MP (1), Sir Thomas Glen-Coats (2), James Clark (3), George Coats (4) and James Drybrough (5) occupying honorary positions. It is at this point we establish that James Drybrough gave permission for the club to use his private garden pond at Arkleston House, Arkleston Road (referenced again in the 1905 AGM report). James Drybrough of Walker, Drybrough and Co .owned the Arkleston Print and Dye Works and adjacent to the Works were two large water reservoirs that the club used until Barshaw Park pond was built. Walker Drybrough also owned Seedhill Finishing Works and this also had a large reservoir. 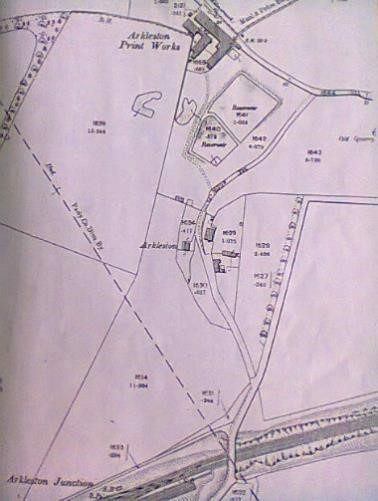 Likewise the 1889 OS map indicates that Gallowhill House had a large curling pond, however the Arkleston House site would appear to be the preferred location given that James Drybrough was Honorary Commodore of the club. 1903 The club travelled with their 12 metre class yachts to other venues, other yachting clubs mentioned in newspaper reports at this time were Johnstone MYC, Dennistoun MYC and Ardrossan MYC. The Ardrossan and Saltcoats Herald of 8th May 1903 reports on a race between Ardrossan model yacht club and PMYC held at Paisley, the home club winning by 7 points to 3. 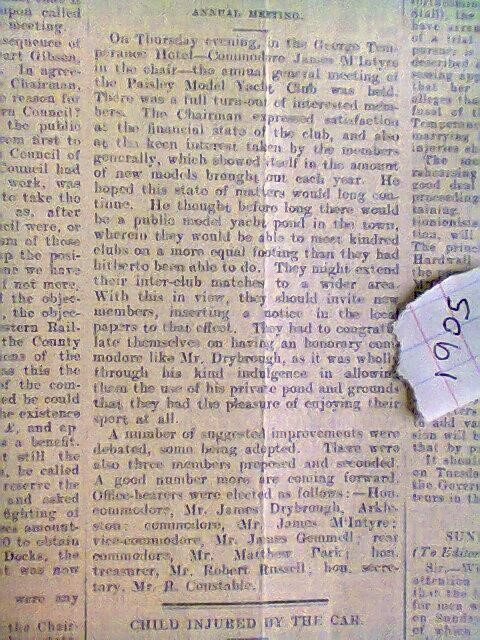 1904 The 29th July Ardrossan Herald reports on a race at the Townhead model yachting club, Kilbirnie Loch. 1905 The 1905 AGM held in the George Temperance Hotel recorded that the club hoped that before long the town would have a public yachting pond so the club could challenge other clubs on an equal footing. 1908 Paisley Model Yacht club affiliates to the Scottish Model Yacht Association. 1911 In December 1911 the council purchased the grounds of Barshaw House to be converted to a public park for the sum of £24000. Work was conducted in the 55 acres to prepare it for public use and the Barshaw Park was opened to the public in July 1912. 1915 At this time during the Great War there were a large number of Belgian refugees who were billeted in Paisley, many of them in Barshaw House. To celebrate King Albert of Belgium’s birthday an oak tree was planted in April 1915, just east of where the present café stands and another one planted in Sir William Dunn Square. Some 500 Belgian refugees attended the event in the park and were addressed by Sir Thomas Glen-Coats who had been in personal contact with King Albert. The town of Paisley had been very kind to the refugees and to this end they remarked that Barshaw Park and Barshaw house would always live in the memory of the Belgian people. 1916 The park was converted to plots for the war effort. 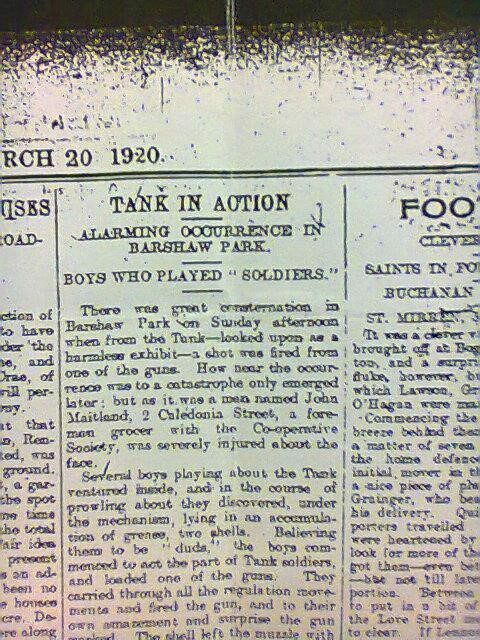 1920 There was a serious incident involving a First World War tank that was situated in the park as a war memorial. Some youths gained access to the tank and found a greased shell. They loaded the shell in the gun and fired it. The shell was actually live and blasted out debris that had been accumulated in the barrel over park users in the vicinity. One member of the public was blinded and several injured. It was fortunate that the muzzle was inclined otherwise the injuries would have been more severe. The tank fired the shell in an easterly direction. Farmers east of the park were warned to look out for a shell that has still never been recovered. 1922 At the27th November Council meeting JR Stutt’s tender offer of £1655 10/- to construct the Bowling greens was accepted by the council. Provost Lang approached William Bow with suggestion to build a model yachting pond in Paisley to assist the unemployed. This was refused. Between 1922 and 1923 a group call The Model Yacht Pond Movement formed to try and get a pond constructed. 1923 At the 29th October Council meeting the Provost Lang suggested that in order to assist the unemployed the much talked about Model Yachting Pond should be built in Barshaw Park. This was agreed and remit sent to the Council Unemployment Committee to submit a scheme to the Government Committee. In November 1923 the site was agreed and after plans prepared the Clerk was informed to apply for the Government grant. The site was staked out in December and the council members viewed the area. 1924 4th February- Mr Lee submitted a plan of the proposed yachting pond showing alterations that may add slightly to the cost, it was agreed to effect these. 20th June- there had been complaints concerning the pay of those under the Unemployment Scheme. JR Stutt increased the wage rate of the men digging the pond from 11d per hour, which was the going rate for gardeners, to 1/- per hour .This did not go down well with the council as they did not have sufficient information on wage rates to decide what the rate should be, however they instructed Mr Stutt to pay the standard rate whatever that was. September -Unemployment Grants committee agreed to extend the scheme to 20th September to allow completion of the Model yachting pond that was behind schedule due to bad weather and issues with the Unemployment grant. October Almost 30 years after the formation of the yachting club, the public pond always hoped for was opened on 4th October 1924 at ceremony attended by some 5000 folk. The opening ceremony was conducted by William Bow (9) a well-known shipbuilder who was instrumental in the pond being constructed. The pond was built with the assistance of a Government Unemployment Grants Committee scheme (£1500) designed to give work to the unemployed and covered 65% of the wages of the men. The cost of the pond was approximately £3000. Mr William Bow donated the £1563 balance of the cost. The pond is 400ft in length, 300 feet wide tapering to 200 feet and has a water area of 2.5 acres. The original depth was from 2 feet to 2.5 feet with a small proportion at 3 feet. The bottom is lined with puddled clay. Water was supplied from the Arkleston Road main and also drainage from the Fisher Fountain coming in at the east side. An overflow sluice to maintain the water level was installed at the Glasgow Road end along with the main drain valve. In remarks at the opening Ex Provost John Robertson CBE (12) wished to associate himself with the expression of congratulations at the satisfactory completion of the work. He had never seen a pond like this for model yachts and it struck him forcibly that it was going to be a great boom to young and old of the town. The opening ceremony was followed by a race between yachtsmen from the Richmond Park, Dennistoun, West of Scotland. Victoria, Elder Park Model Yacht clubs and of course PMYC. On the following Saturday the race prizes, donated by Mr Hutchison of Aldersyde, were presented to the winners who were from Richmond club. 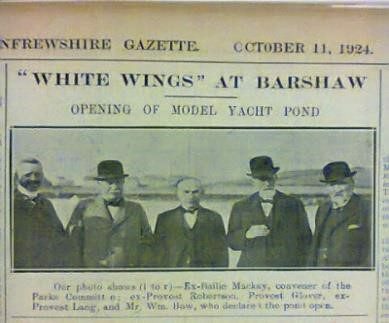 At this point the Model Yacht Pond Movement group whose secretary was Archibald Muir advertised in the Paisley Daily Express of a meeting to be held to form the Model Yacht Club in Paisley Barshaw Park and to gain new members. On 28th October the Club asked permission of the council to store their yachts in the tennis pavilion however this was refused as there was not sufficient room available. November The club was doing well and now had 50 members .An exhibition was advertised in the Paisley Daily Express that was subsequently held in the Gibson Tea Room, High Street on 21st November. This proved very successful and well attended. Allan Coats gave a presentation on yacht design and William Hutchison presented on sail making. A power boat section was as a result of the interest shown added to the club. Mr JR Stutt reported that the cost of the pond was £3023 9s 11d against the Final Measurement of £2250 0s 8d so that on the contract he lost £773 9s 3d, This was primarily down to the increase in the wage rate of 1d per hour and issues with the Unemployment grant scheme, The Clerk was instructed to communicate with Mr Bow and the Unemployment Grants Committee. December The Unemployment Grants Committee responded that they would reimburse Mr Stutt for the increase in hourly rate of one penny provided the amount did not exceed £1500. The Robertson Cup for International 6 metre model yacht competition between Scotland and England was instigated. This cup was originally donated by W.F.Robertson (13) who was a well-known yachtsman on the Clyde. The cup was the trophy he won with his famous six metre yacht’ Caryl’ in the Royal Northern Yacht Club Ardrishaig race.’ Caryl’ also won the Seawanhaka Cup (19) under W.F Robertson and both represented Britain in the 1922 British-American cup. The Robertson Cup was conducted under the flag of the West of Scotland Model Yacht Club for the encouragement of the 6 meter model class. 1925 Council receive cheque from William Bow to the value £1563 18s 3d in payment of pond. 13th January -With reference to the Unemployment Grants Committee minutes, the Provost stated ‘that it was a matter of great satisfaction to the town that it now had at last a model yachting pond in Barshaw Park that would give great pleasure to both young and old. As is generally known the town was relieved of all financial liability due to the generosity of Mr William Bow of Priory Park’. He moved that a hearty thanks been shown to Mr Bow. On 26th January a delegation from PMYC consisting of Messrs Allan Coats (21), Hutchison and Muir (14) attended the council meeting. Mr Coats requested the committee to consider the erection of a building to house the yachts.Councillor McKay stated that the erection of a clubhouse had not been considered by the Parks Committee but Mr Coats request would be put before the next Parks Committee meeting. The Convener later stated that there was stable accommodation in the park available that would be suitable for accommodating the model yachts .It was agreed to let the stable to the Yachting club for £3 per annum. (At this time the council still used the park to gather in revenue from grazing and stabling fees) In June the yachting club agreed to continue at present in the stable. 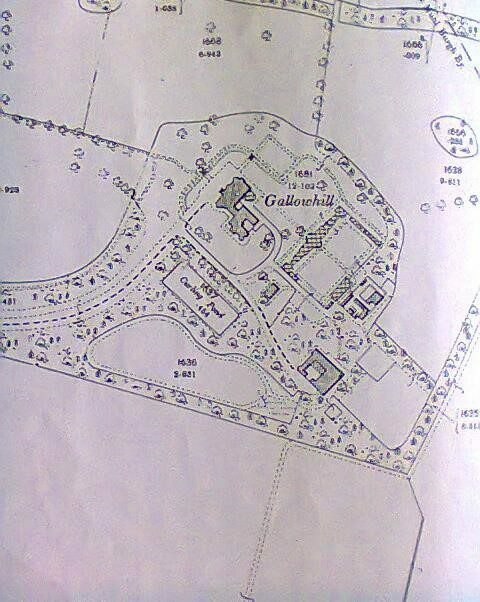 On 6th October the yachting club wrote to the council requesting a boathouse near the pond side be constructed. The council responded that the matter was being given consideration by the Parks committee. On 26th October councillors visited the park to look at the site for the new proposed golf course clubhouse. Mr Lee was instructed to draw up 2 plans to accommodate golfers, yachters and a house for the Superintendent and one showing accommodation for golfers and yachters only. The 3rd December Paisley Express reported that 200 persons were skating and sliding on the iced over new Barshaw pond. Among those skating were a group of clergy much to the amusement of those at the pond. After 50 years existence Lochfield Skating Club pond had fell into disrepair and some remaining members may have been amongst those using Barshaw pond. 1926 26th January -There were 5 tenders submitted to construct the new proposed public golf course on land obtained from Mr Young of Barshaw Farm. The contract was won by J.R Stutt to make putting greens and bunkers at the tender price of £1190. Mr Lee submitted plans of proposed clubhouse but after discussion it was agreed to delay consideration till after a meeting had been arranged with representatives of Paisley Model Yacht Club. On 15th February a delegation from PMYC again consisting of Messrs Coats, Hutchison and Muir were introduced to the Parks Committee. Mr Coats outlined the accommodation required by the yachting club and the membership numbers. Afterwards the Parks Committee recommended to the Council that the plan submitted by Mr Lee should be got on with and that the rental to be charged the Model yacht club be £20 annually for the first two years. 1927 On 26th February the much anticipated new yacht club boathouse and golf club house was opened. 1928 24th May inaugural ‘Blair Regatta’ held where the prizes were donated by Mr Joseph Blair (Spirit Merchant) A regatta was held at Johnstone Model Yacht Club on 9th June where seventeen 12 metre yachts competed. One of the yachts competing was ‘Iris’ a probable model of Thomas Glen Coats full size yacht built in 1926 by Bute Slip Dock. Another yacht competing was Coila III that may have been a scaled up version of the 6 metre yacht sailed by FJ Stephen in the British American Cup that had W.F.Robertson as crewman. On 23rd June the PMYC flag was unveiled on the boathouse by Miss A. Coats of Hayfield, Castlehead (17). The prize giving for the race held that afternoon was conducted by Mr J.O.M Clark. 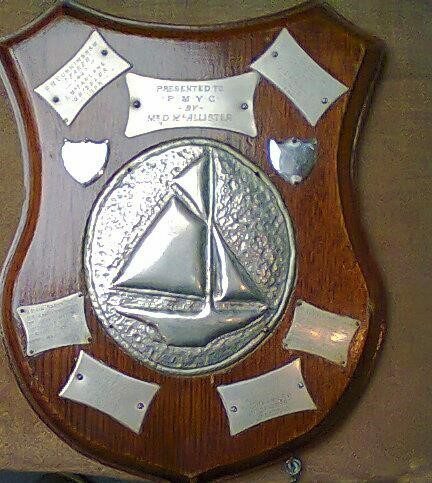 The ‘D McAllister’ Shield was first sailed. In December at the annual social held in the Cooperative Hall, Causeyside St, Mr J.O.M Clark accepted the post of Hon Commodore of the club. The club also proposed to form a Shire association consisting of Ayrshire, Renfrewshire and Dunbartonshire. 1929 The Rita Cup instigated. 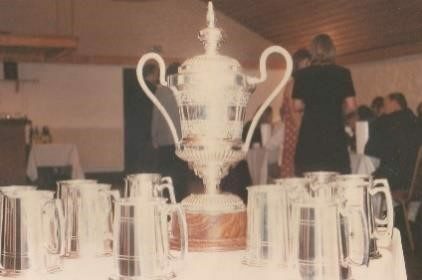 This was the Inter-shire race discussed above, consisting of model yacht clubs from Renfrewshire, Ayrshire and Dunbartonshire, the overall winners at the end of the season being awarded the Rita Cup. 1930 The fields in front of Barshaw Hospital that had hitherto been let to grazing were not re-let and added to the park. 1935 The PMYC Crest was designed after consultation with St Andrew Society (Glasgow) (18) This was produced utilising the red, yellow, blue and white colours found in the coat of arms of Renfrewshire, Ayrshire and Dunbartonshire. 1941 A Luftwaffe bomb exploded in the park just behind the row of trees at the café .Fortunately no one was hurt. Half the golf course was converted over for Agriculture use. 1950-54 The club sailed predominately 6 metre yachts, note the Braine steering gear designed in 1930s by George Braine that replaced the weighted rudder method of steering yachts, later to be replaced by Vane gear steering. David Leggat racing in 1952, note the similarity to the R6 Dolphin design of today & the shelter on the hill. David was a woodwork teacher at the ‘Kibble School’ in Paisley and built his own yachts. 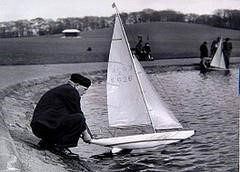 1952 British and European 12Metre Champion sailing ‘Enigma’ at Barshaw pond, … Mr Hugh Shields. In the late 1950s the ‘Marblehead’ class of yacht was introduced and became the predominant style of yacht sailed. One of the major trophies sailed for was the McGruer Trophy donated by the McGruer family in memory of their daughter Heather. McGruer were famous yacht builders based on the Clyde at Clynder (20). 1980-90s The 1980s saw the introduction of radio control and fleet racing became popular on the pond. In the mid-1990s the six metre class made a return to the club sailing scene, this time in the form of the radio 6 metre – The Windermere Plaque attracting a fleet of over 30 R6M yachts. The centenary of the club was celebrated in 1996 with a Scotland v England challenge for the ‘Karachi Cup’ donated by club commodore Mr Mike Barr (director of AG Barr Ltd) who bought the cup on a business trip in Karachi. In continuance of the historical link between academia and PMYC, in 1999, under the auspices of our current club secretary David L Smith (23), the Department of Ship & Marine Technology (now the Department of Naval Architecture, Offshore and Marine Engineering) at Strathclyde University in Glasgow decided to set up a competition for secondary school pupils to Design, Build and Race Radio Controlled Model Yachts with the aim of interesting school children in careers in Naval Architecture & Shipbuilding. Gordon Price the Secretary of Paisley MYC and Scottish District Councillor of the Model Yachting Association gave advice on the ‘Strathclyde 70’ rules for the yachts and offered the assistance of PMYC in running the Race Day. The competition ran until 2006 with prizes sponsored by Lloyds Register and attracted up to 15 yachts to Barshaw Park in June each year. The Department also decided to adopt the Strathclyde 70 as the Design, Build and Test element of the Engineering Applications class taken by their 2nd Year Naval Architecture students. Teams of four or five students would design and build their yachts at the University over the winter and then bring them to Barshaw Park for a late spring afternoon of keen racing. Five yachts contested the first Departmental Challenge rising to ten boats by 2009, all under the supervision of race officials from PMYC. Due to staff changes at the University and rising numbers of students not all of the students now come to Barshaw Park but the invitation is extended each year and accepted by the keenest teams. 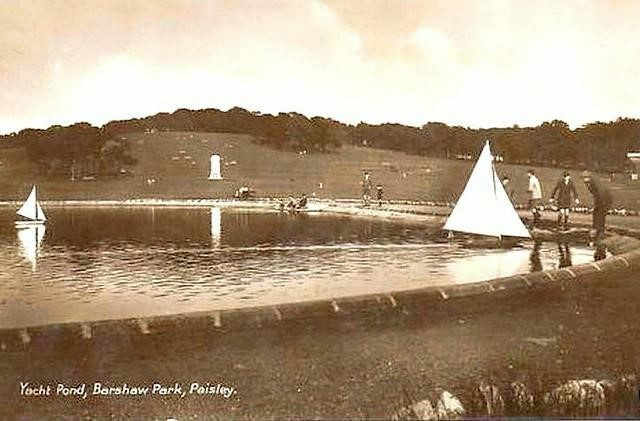 Over the duration of the two competitions several hundred young people have been introduced to Barshaw Park, Paisley, and to the sport of Radio Sailing by the members of Paisley MYC. 2000 The early 2000s saw the rapid increase in the one metre yacht class (IOM). This quickly became the most popular class sailed today. 3 James Clark of Anchor Thread Works Seedhill. 4 George Coats director of J &P Coats. Well known sailor on the Clyde, raised to the peerage as Baron Glentaner in 1916. 5 James Drybrough owned the Walker, Drybrough and Company, Print and Dye Works, Arkleston. His home was Arkleston House, Arkleston Road. He was Hon Commodore of the yachting club and allowed the use of the reservoir within the print work grounds for the club to sail on. Walker Drybrough & Co were shawl dyers, printers and scourers. The firm started in the mid1850s and ceased trading in 1920. 6 Thomas C. Glen Coats -elder son of Sir Thomas, assumed the Baronetcy in 1922. Well known 12metre and six metre yachtsman, winner of 12metre yachting gold medal at 1908 Olympics. Also designed model and full sized yachts and worked for Alfred Mylne yacht designers. Some models of his yachts were sailed by PMYC. Often raced against Norman Clark Neill (member of the Clark family) on the Clyde for places in the British American cup. 7 William Hutchison, owned the William Hutchison Jun & Co. Scouring Mill in George Place. The Sma’ Shot Cottages were originally part of an area known as St Mirin’s Square and were used to accommodate workers at the old St Mirin’s Mill, which closed down in the early 1800s. Workers from the Hutchison’s Scouring Mills then occupied the buildings before they were bought by Wilson’s Market and used to house some of their key workers. William Hutchison was a member of the PMYC delegation to the council that requested the club boathouse to be built. 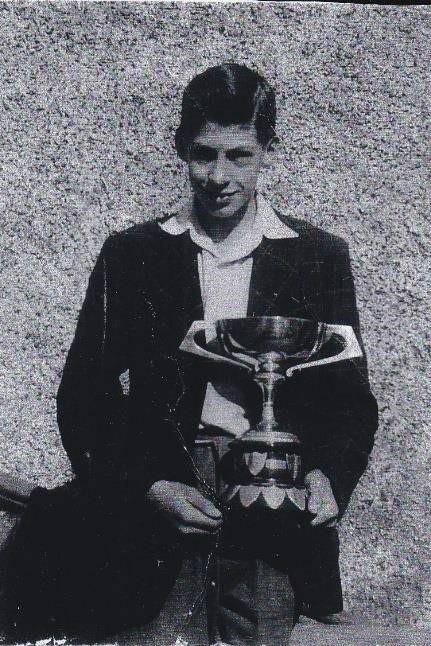 He also donated the Hutchison Cup to the club for the Six Metre SMYA National Championship. 9 William Bow (1856-1927), of Bow, McLachlan and Company, one of five Paisley shipbuilders in the early twentieth century. Bow McLachlan and Company initially engaged in the making of steam steering gear, for which they had a patent. The business developed rapidly, and at the time was one of the best known in the country. The firm had a unique record during their long association with the Admiralty and during the First World War they supplied at least 75 percent of the steam steering gear required by the Navy and never had a recorded failure. His Abbotsinch yard specialised in tugs and was one of the pioneers of “kit boats”, pre-fabricated in the upriver yard and reassembled as and where required. In WW1 they built small warships. The yard closed in 1932 but was re-opened during the Second World War by P. W. MacLellan to fabricate landing craft for the D-Day invasion. Bow was instrumental in the widening of the River Cart, the construction of the Inchinnan Swing Bridge and took great interest in its design and construction along with making financial contribution to the cost. Bow was an enthusiastic supporter of day-release schemes under which his apprentices attended courses at Paisley Technical College (now the University of the West of Scotland). In 1928 he gave his house, Dunscore, to the college for use as a residence for the Principal, and moved along Main Road to Priory Park. He also left the William Bow ‘Post Graduate Studentship’ legacy to the College. His interest in the welfare of the townspeople took a practicable form also when the model yachting pond was being constructed at Barshaw Park. This scheme was undertaken because assistance could be had from the Government. Bow sat on the town council Unemployment Grants Committee and was instrumental in the agreement to award the one penny per hour wage increase during the pond construction .The cost of the pond was over £3000, of which £1500 was secured in a grant, and Mr. Bow generously bore the expense of the balance, amounting to £1563.Hon Commodore of PMYC. 10 John R Stutt. 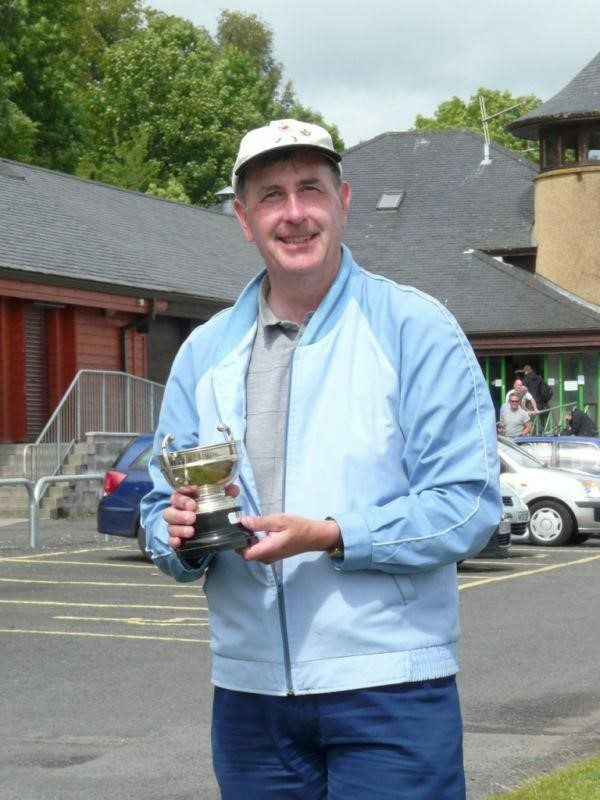 Became a well-known golf course constructor throughout GB and Ireland. John R Stutt established his landscape and sportsground construction business in Barrhead in 1919, Stutt worked with the acclaimed James Braid on numerous golf courses, including Carnoustie, Royal Dornoch and Dalmahoy. His son John Hamilton Stutt also became a well-respected designer and constructor of golf courses. 11 Peter Eadie devised a machine to produce ‘ring travellers’ a vital component in textile spinning machinery. He sold the ‘ring travellers’ to the Paisley mills and all round the world and set up a factory in Paisley’s Violet St. to produce them (Eadie Bros & Co. Ltd). Became Provost in 1905-1908 and died in 1919.His great grandson was the late Tony Benn MP. 12 John Robertson CBE was provost of Paisley and chairman of the family business, James Robertson and Sons Preserve Manufacturers. His father James started the business producing Golden Shred marmalade. His eldest son John succeeded as company chairman, establishing the firm as a leader in the preserves industry. Robertson’s were awarded royal warrants by King George V in 1933, King George VI and also by the present Queen Elizabeth. John after a trip to America just before World War One, brought back the Golly mascot that became the trade mark for all the company goods.The original factory was based in Paisley and is now a housing estate, St. Andrew’s Court, with the street itself named Robertson’s Gait. 13 William Francis Robertson chairman of the Clyde Navigation Trust and Ship owner with some 40 ships in the coastal trade… known as the ‘Gem line’ due to the ships being named after gem stones. Well known yachtsman on the Clyde, he was a member of the committee controlling the British American Cup and who won the Seawanhaka cup. His father William who founded the business, never forgot his humble beginnings and retained an affection for the Burgh that raised him – Renfrew. In August of 1909 he donated around 30 acres of land to be used by the Townsmen as a Public Park for the people of Renfrew – which was named the Robertson Park as it remains to this day. 14 Archibald Muir. Campaigned for the pond to be built. Member of the delegation that requested a boathouse to be constructed. He was a tobacconist, cigar merchant and shipping agent, his shop being located in Moss Street. 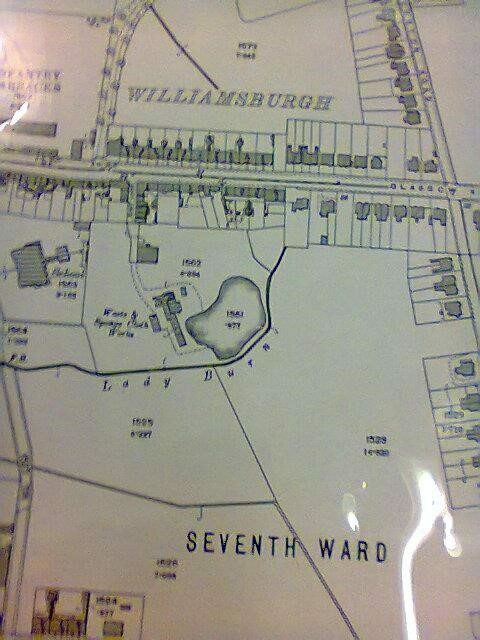 16 Robert Findlay Paterson was a Paisley dentist who lived opposite the pond in Glasgow Road. He was President of the Glasgow Odonatological Society. Member of the yacht club and deputised for club commodore Allan Coats of Hayfield if he was away on business. 17 Miss Agnes Coats of Hayfield. Member of the Coats family often presided at club sailing prize giving and club social evening events. Sister of Allan Coats. 18 St Andrews Society (Heraldic) Glasgow gave guidance on the club crest design incorporating aspects of Ayrshire, Renfrewshire and Dunbartonshire coats of arms. 21 Allan B Coats BSc of Hayfield. Commodore of Club. He was a Mechanical Engineer and graduated from Glasgow University. Donated trophy bearing his name to the club. The family firm was W. & A. Coats Ham Curers and Grocers, whose premises were 68 Broomlands.- The Coats Farthing. -Back about the mid 1800’s ‘Coats Farthing’ was a ‘currency’ in the West end of Paisley, issued by Coats Ham Curers as a means of combating the spread of counterfeit coins. The Shop was run by William Coats and his father Jervis, and due to Jervis’s poor eyesight it became a target as a place to pass off remastered and worthless coinage. In an attempt to overcome the problem, and the related loss to the business, the family had the counterfeits melted down and turned into ‘Coats farthings’ which people could then use as normal currency. This branch of the Coats family, who at that time lived in William Street, were the poorer side of the famous Paisley Coats clan and to distinguish themselves they humorously called themselves the ‘Petty Coats’ . Nevertheless Joseph Coats, a son, went on to become the first Professor of Pathology at Glasgow University, and his brother George an eminent Eye Surgeon in London. 22 Extract from Vintage Model Yacht Group website confirming Thomas Glen Coats designed and sailed model yachts. –‘The first models to the Rule were built and sailed in competition by The London MYC which contained several designers of full size craft including Tommy Glen-Coats and E R Tatchell. The first open race for boats to the new Rule was held on the Round Pond in March of 1907, before any full size craft to the Rule had been completed. Designated as ‘1-metre’ boats to the International Rule, the fleet had three boats designed by Glen-Coats, three by Tatchell and three by John Odgers, a member of the MYSA club that shared the water, though not the social pretensions, of the London MYC. The London MYC took themselves and their contribution to the advance of naval architecture very seriously. Their young and enthusiastic Secretary, Percy Tatchell suggested that full size designers might have their designs tested by allowing London members to build and sail models of them. 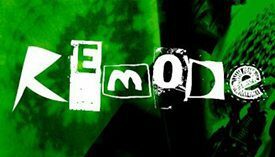 This was not taken up by any designers outside the London itself. Glen-Coats progressed rapidly from designing ‘1-metre’ models to designing the first two full size 12-m to be built in Britain, one for himself and one for his uncle. He won a gold medal in the 1908 Olympic Games with his boat Hera.’ His uncle was George Coats younger brother of Sir Thomas Glen Coats. The yacht was called ‘Alanchie’ and was built by R. McAlister, yacht builders Dumbarton. Incidentally R.McAlister also constructed 4 collapsible life boats for RMS Titanic from one of which Joseph Bruce Ismay, President of the White Star Line was rescued. So we know that the cost of the pond was donated to the town by William Bow but what about the Yacht Pavilion? Throughout the formative years members of the Clarks and Coats families were associated with our model yachting club. This is not surprising as they were already deeply involved in full size yacht racing and development. Furthermore in 1887 George Coats and John Clark of the Paisley thread mills, had led the syndicate that built the Scottish America’s Cup challenger ‘Thistle’, sailing against the millionaires of the New York Yacht Club’s yacht ‘Volunteer’. This would no doubt have introduced Thomas Glen Coats to the sport encouraging his designing skills via model yachts before going onto full size design/racing. Given the philanthropy of the Coats and Clark’s in making donations to many local Paisley sports clubs, it would give credence to the traditional belief of the club membership that the yacht club pavilion was donated to the yacht club by the Coats. Tracing the evidence for this has so far proved elusive. The Town Council minutes refer to the pavilion being sent out for tender but nothing is recorded as to who won the contract or the cost. This omission appears very strange given that the council recorded to the last penny all other types of expenditure, even recording that two wooden hut shelters were to be built on the golf course at a cost of £50 and such items as the number of turnips given to the poor noted in the minutes……It will be recorded somewhere so will keep searching! for bringing this forward and adding more history to our wee town of Paisley!